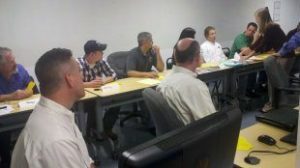 On Thursday, July 19, 2012, Panel Built, Inc. hosted a LEAN Consortium in conjunction with Georgia Tech at PBI’s manufacturing plant. While Panel Built has been a part of the Consortium for nearly a year now, this was the first LEAN Consortium event held at Panel Built’s facilities. This event was a “benchmarking” event which consisted of a brief introduction to Panel Built, our products and processes, followed by a tour where the visiting Consortium members ask questions and give suggestions on how to improve our LEAN efforts. The companies participating in this event included L3 Communications, Packaging Specialties, American Boa, Larson-Juhl, and IPA. A LEAN Consortium is essentially a group of companies/corporations who gather to share ideals to help with continued growth and improvement. The goal of the Consortium is to help businesses become more efficient or “leaner”. * Benchmarking Activities – tour both member and non-member sites to see best practices, hear “lessons learned”, and get ideas for additional streamlining opportunities for your company. * Training – participate in leadership events, workshops, book reviews, and webinars designed to further your knowledge of LEAN implementation. * Networking Events – build and leverage relationships with peers across many disciplines. * Leadership Development – develop your management team’s knowledge on LEAN organizations and subsequent results. To illustrate some of LEAN’s impact, at last year’s consortium, Packaging Specialties shared their idea of the “War Room” which was their solution to the common problem of time consuming and unproductive morning meetings. 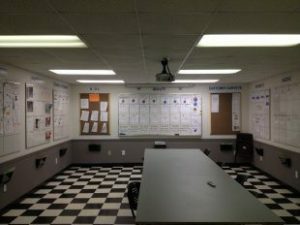 A “War Room” charts daily schedules and other “need to knows” on the walls of a room. This leads to short, productive meetings that release people quickly to go do their jobs. Panel Built embraced this idea with open arms and it has been a successful tool, making more efficient use of time and giving proper attention to often over-looked issues like safety, housekeeping, and training. As a company, Panel Built is committed to LEAN Manufacturing methods in order to improve efficiency, reduce waste, and pass the savings on to our customers. We look forward to the next LEAN Consortium event, and the learning opportunities it will provide. Panel Built will be hosting a variety of LEAN Consortium events through the end of the year, including: a general LEAN training event in August, standardized work training event in September, and a multi-day LEAN Boot Camp between Thanksgiving and Christmas.